How has your week been? I have been reading lately, when I’ve been able to have a few spare moments before bedtime, and one great book that I just finished is Me, Myself, and Bob by Phil Vischer, founder of Big Idea Productions (the man who started Veggie Tales). My sweet friend Kimberly Ehlers told me about the book, and as I finally read the last 3 chapters, tears poured down my face. As I shared with a few family members and friends this week, this book has just demolished me. In Me, Myself, and Bob, Phil shares the story of the big dream that began in his heart when he was just a young man, to become the “Christian” Walt Disney, to build a new media empire for God – teaching children funny, touching stories using the talking, colorful vegetables (Bob the Tomato, Larry the Cucumber and other characters) and using the truth of God’s word…unapologetically including God and His word. Phil wanted to change the world with his big idea. As Big Idea Productions grew bigger, so did its budget – and its enormous debt. 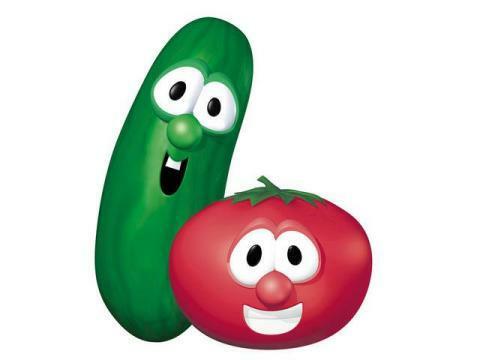 Veggie Tales sold more than six million Veggie Tales videos in 1998. Between 1996 and 1998, its revenue grew by 3, 300 percent – from $1.3 million to $44 million. Between 1996 to 1998, their marketing department grew from 1 person to 30 people. Big Ideas had grown from an original staff of two creative, enthused college guys to 315 people. Yet by the time Big Ideas produced its first feature film, Jonah-A Veggie Tales movie, Big Ideas was in serious financial trouble. The company eventually went bankrupt and was auctioned to Classic Media, at $19.6 million in 2003. What matters more to you – God or your big dream? Phil also shared from Henry Blackaby, author of the devotional study Experiencing God, who wrote a book studying the life of Samuel. This is where I couldn’t stop crying. The thought that I may have been doing many things over the last year (such as writing, speaking, blogging, podcasting, creating information products, writing a bi-monthly ezine, forming relationships through social media), the possibility that these things may not have come from God, but came from myself, was devastating. Only God knows if this is true and that is what I am praying about this week, for clarity and wisdom. I don’t want to do anything that God doesn’t authenticate or authorize. I don’t want to be like Aaron’s sons Nadab and Abihu, offering unauthorized fire (Leviticus 10: 1), or to be like the foolish man who built his house on the sand, instead of the Rock of Christ, and when the rain, wind, and floods came, it collapsed and was destroyed. (Matthew 7: 24-29) Anything apart from Jesus will not bear fruit and won’t last. As a result of this book, I have taken some time this week to pray and seek God on His will, His purposes, His vision for my life. I am still thinking things through, asking for Him to speak to me clearly. My dear sister Maria said God may have used this book as a warning to me about future success – to not let my dreams become an idol. Yes, there are dreams in my heart, big, big dreams! I don’t want to live a medicore, boring life and want to do great things for God! I believe God is the one who put those dreams there in my heart, because He’s a big God and has big plans for His glory. 🙂 The Bible says nothing is impossible with God. (Luke 1:37) God is the Dream-Giver and the Dream-Fulfiller. But I never want my dreams to mean more to me than God does. I only want to please Him and do His will, not my own. (Luke 22: 42) While I desire to do great things for God in this lifetime and to make an eternal, significant mark on the timeline of history, influencing and impacting others’ lives, most of all what I want is an intimate relationship with God. For every part of my life to glorify Jesus Christ. ***What are your thoughts on all this? I invite you to comment below. Thanks, Kimberly, as always for your encouragement! You’re such a blessing! Powerful article and beautifully written, Beth! Thank you for sharing your insight. I know that I will re-read and re-read certain sections of this book, and I’ll re-read this article over and over because you really nailed the truth. Wow. What a great reminder to make sure that God is what we pursue, and that our dream is what God wants us to do.